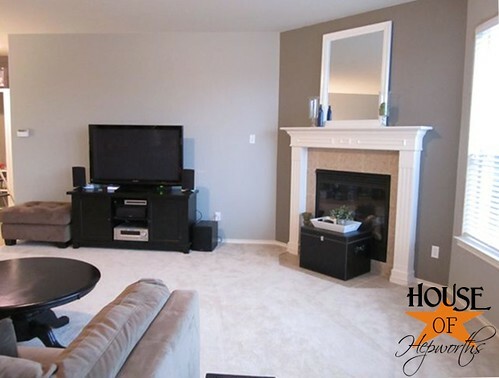 The family room is painted! Last week I bit off almost more than I could chew when I decided to paint the family room, kitchen, AND hallway all in one shebang. 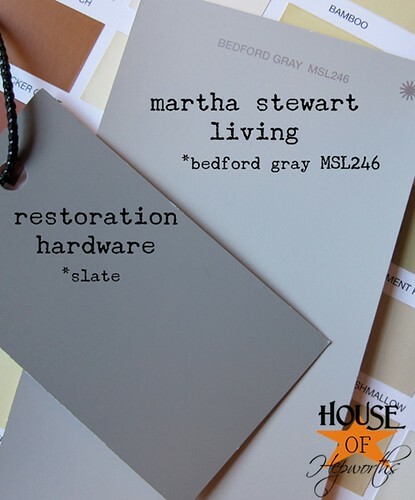 I decided my primary color would be Bedford Gray by Martha Stewart Living & my accent color would be Slate by Restoration Hardware. I left you on the edges of your seats last Thursday when I showed you the room only half finished. Well, I’m finally back to show you the remainder of the huge project I foolishly thought I could finish in only two days. I painted into the wee hours of the night to finish this job and get my house back in livable condition. Here’s the fireplace wall (still wet!) with the new accent color – Slate. The next morning I snapped a few pictures while the house was still torn apart. The difference in color between the main color and the accent color ended up not being quite as dramatic as I assumed it would be, but I still love it. Once I had my living room and kitchen put back together I took a few more pictures. I don’t like how dark this picture turned out (lighting-wise, not paint-wise) but it’s hard to get a well light picture from this angle because of the windows. The family room looking into the kitchen. 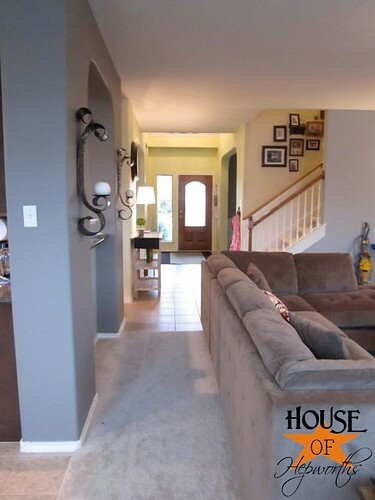 You can see part of my yellow entry way on the right, so this picture has all three colors in it – the light gray, dark gray, and yellow. Looking through the arch from the kitchen sink into the family room. 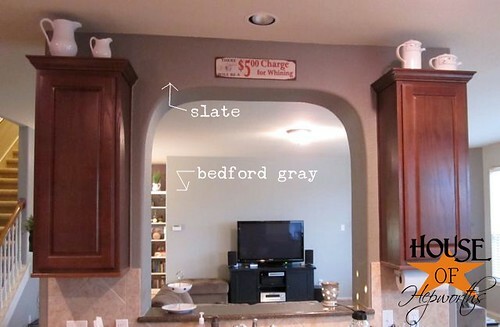 One of my favorite things in the kitchen is my sign above the arch that says “There will be a $5.00 charge for whining”. Obviously the room is still a huge work-in-progress, so don’t squint and look too closely at all my furniture and “decor”. Here’s another of almost the same angle. I couldn’t choose which I liked better, so I’m posting both images. From my living room to my entry way. My piano room is to the right on the other side of the stairs. Also, there’s been some interest in the paint color in my stairwell… I’ve only painted white below the rail. Above the rail is basic builder beige that came with the house. That wall will eventually end up yellow. To say that I love this color so much more than the previous one is an understatement. Believe it or not, this room is actually starting to come together, one baby step at a time. Love the change. In our living room and kitchen we have a combination of mustard-ish and brick. And very dark, very thick stained crown in the living room. I am all about lightening up these rooms this summer when I can paint but I have no idea what to do. 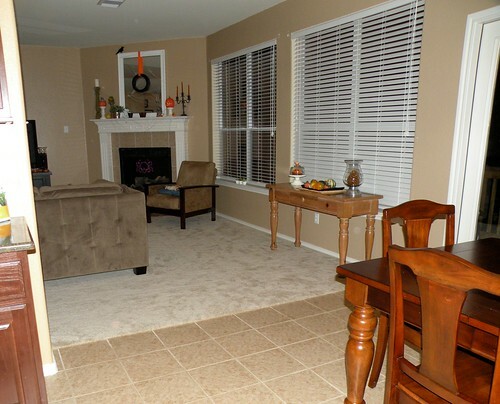 The trim has to stay unpainted as we are renters, but you have definitely given inspiration. The rooms turned out amazing! Love the colors you chose! That must have been ALOT of work, your rooms are huge and gorgeous!!! i love the difference that it made! great color choice!!! Really nice, such a difference! 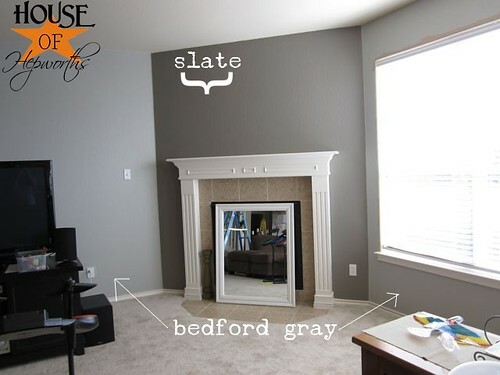 I’m loven the gray shade that you have on your fireplace wall, everything turned out great! WOW the rooms look so different and elegant. You must be exhausted I think a grande latte is calling. I crown you the official painting Diva!! Love the colors you chose…. the gray looks soooooooooo much better than the color that was there. Great job! It’s beautiful! 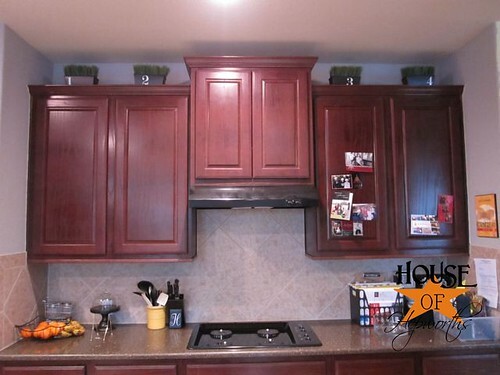 It’s amazing to me how the paint color changed the color of your kitchen cabinets, and you didn’t even touch them! Maybe I am just crazy, but it seemed to lighten them up too! Love it!! I can’t wait to see what else you do with your house! I love the colors you chose. They look perfect together. Love the colors, they look great! Our entire home is that “builders beige” you mentioned and after two years it’s really starting to wear on me. It doesn’t help that all the carpet and tiles are that color, too. 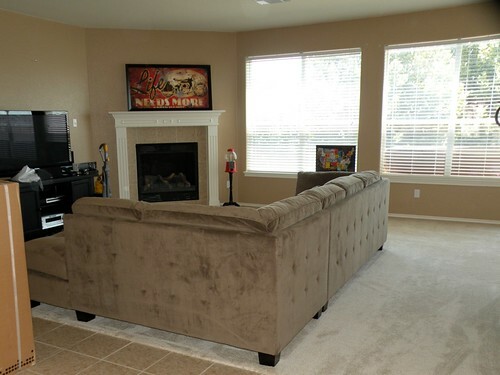 But I’ve been afraid to paint, to mess up the cohesiveness of the house…and worried about messing it up for resale. Finally, I am ready for paint! I decided I’m the one who has to live with it, anyway, so I should love it… and it can always be repainted. Your post makes me look forward to finishing my first painting project! I love yellow and grey together. I’m sure I just saw a gorgeous room with those two colors. Maybe in Better Homes and Gardens this month? I can’t remember. They are just so nice! I love grey as a neutral. WOW !! I love what you have done. I’ve been told that gray is the new beige !! Great choice of gray tones. You go girl !! Lookin’ good 🙂 I’m loving the Slate color!!! The gray is SUCH a better color! Good work, girl! Snazzy! The gray with the yellow is so crisp, but totally unexpected. Kudos! I love that shade of gray(s) you chose! 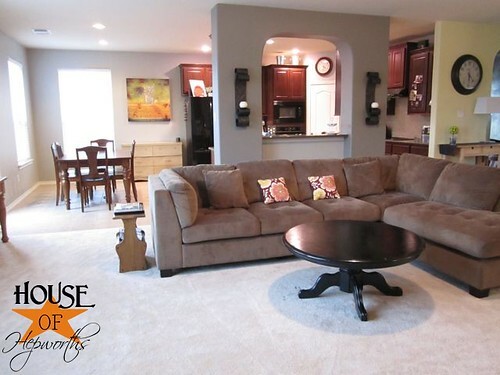 They have just enough warmth in them to make all the beige of your furniture and flooring work, too – AWESOME job!! 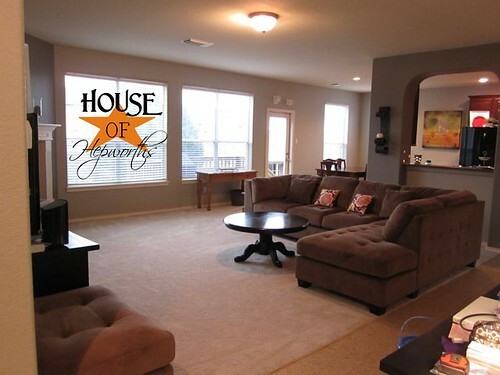 Hey Allison, i love your home, and the grey’s you picked out are beautiful. I have been looking for the perfect grey forever and i finally decided on one today, i got Flagstone by Martha Stewart. Thanks for checking out my blog, your blog is so cute, i’m off to find your cow and pig in your kitchen! IT LOOKS SO GOOD! YOU’RE AMAZING!! 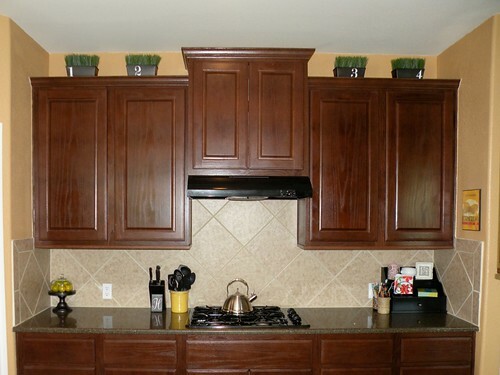 The grey in the kitchen makes the backsplash look brand new! I love all of it! I love the gray! It’s so refreshing. 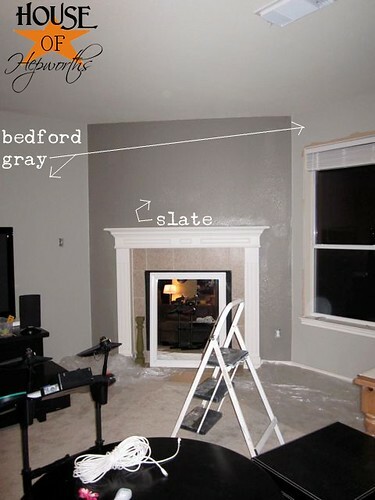 Bedford Gray is actually a color I’m considering for my family…if and when we ever get started on it. This definitely gives a great visual! I love what you did!! I love the two colors, you did it wonderfully! I love how the darker grey has just the slightest touch of blue. LOVE THE ROOMS! What crap pile? lol Speaking of crap piles, I had my house appraised this AM. Wouldn’t you know? the appraiser takes a picture of my washer and dryer and there was a craft crap pile I didn’t get to. Shoot we had ran ourselves ragged all weekend getting our house in tip top shape. Well I ran out of energy when it came to that pile. opps!! 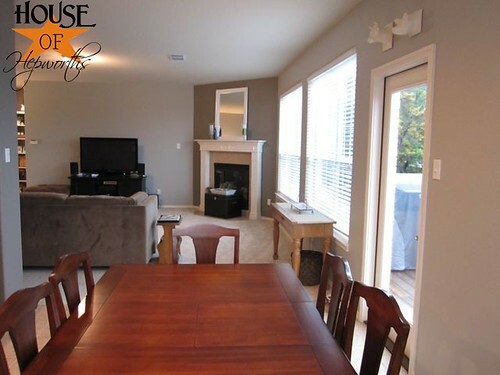 but..the coffee table, kitchen and dining table looked good and even my daughter’s room was clean. You’ve inspired me to paint my FRN this weekend! 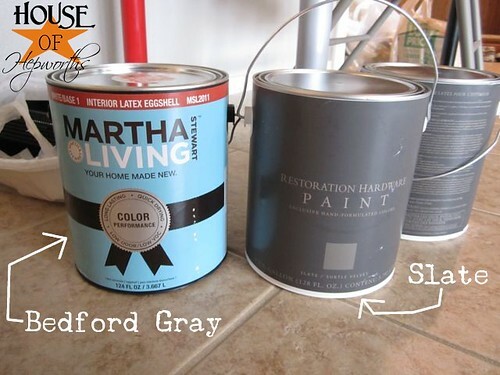 How did you like the Martha paint? Did it cover in one coat? Any recs for a roller cover? 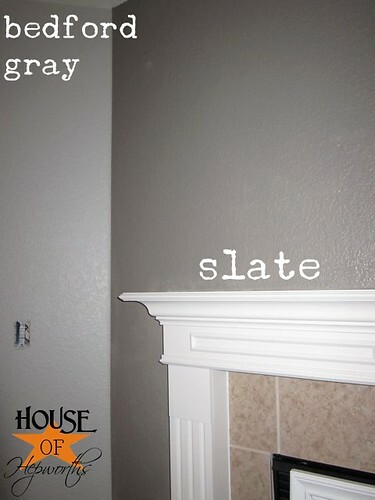 I love your choice of gray, I picked a color very similar to your Slate for my living room and fell in love with it instantly, didn’t quite know color to choose to go with southwest tiles, will have to try your perfect line trick next time I paint. thanks for sharing! Looks great. Is the bedford gray a blue-gray or a true gray? I’d say it’s a blue gray? I don’t know. In some light it looks straight gray but in other light it has a slight blue tone to it. I tried to get one that would match my brown sofa. Hi I’m visiting from handy man, crafty woman. Wow you are really handy! I am impressed. Anyway I love your round coffee table. Where’d you get it? Or, is it a redo of an old one? 🙂 We will need a new one soon and it would fit the bill. Thanks! The coffee table actually was purchased by my friend off Craigslist for $35. She spray painted it black and used it for awhile and then sold it to me. It needs a new coat of paint, but I love it! I LOVE, LOVE, LOVE the Slate color!! Beauuuutiful!! did you get your couch at costco?? 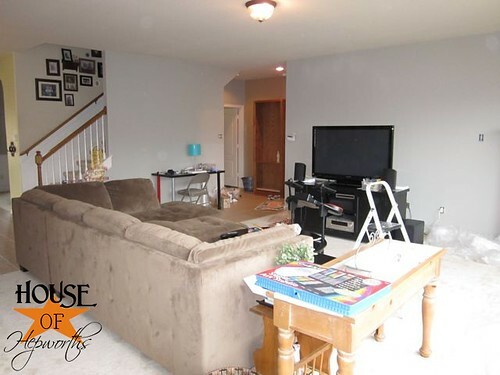 we are refinishing our basement, and i have my heart set on painting it gray. i was thinking about a black couch..anyway. last night we found a couch just like yours at costco and we want to buy it. 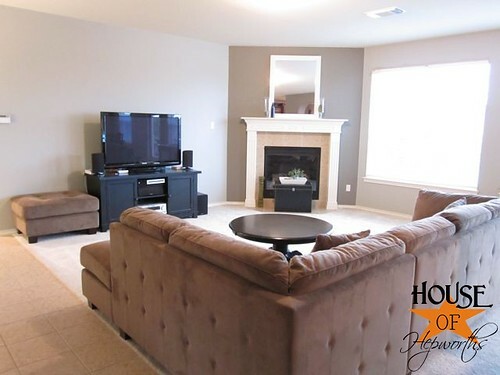 my concern was that the color would clash with gray, but i was thinking i had seen a tan couch and gray walls on your blog. i got on today to look and it was true. i didn’t dream it up. anyway. i think yours looks fabulous! it doesn’t clash and it goes great together. anyway. i don’t know why i’m telling you this? i guess just to say thanks for this post because now i am even more excited to get going on my project! Hi there, I stopped by here for the inspiration of the gray walls. I love the 2 colors that you chose. Where did you buy the Accent Color Restoartion Hardware Paint? It is my first time to paint my walls gray and I’m excited! Looks great! 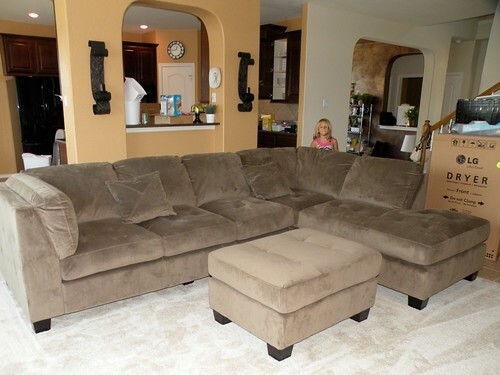 Can you tell me where you found your sectional? I am inspired by the improvements made thus far. I just want to go out and purchase some paint RIGHT NOW! In my opinion, I think you should pain the small table infront of the window black to appear as a set with the black table infront of the couch and maybe add some white accesories to it. Just a suggestion! Looks great! I’ve been searching for the perfect gray for me bedroom. 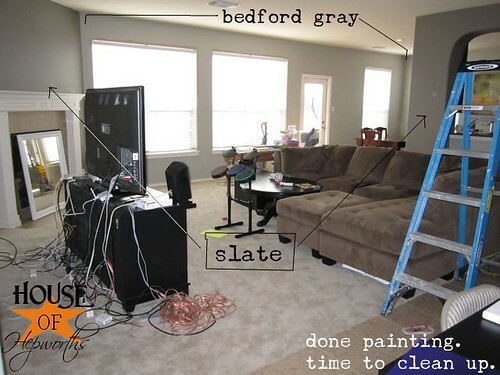 A friend used Bedford Gray in her home & recommended it, so I was looking at pics of it online. It’s very nice! You’ve done a great job & made good choices! Isn’t that sense of accomplishment nice? !